All Fisher & Paykel DishDrawers have superior washing using variable water pressure, flow-through detergent dispensers, and precise water temperatures. It's like a spa for dishes! Each Fisher & Paykel drawer is independently operated, allowing you to wash small loads as economically as large ones. 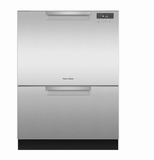 Fisher and Paykel Dishwashers come with a Two Year Parts and Labor Warranty.